ACME GO is the updated model and direct successor of the discontinued vMix GO. By boosting processing power, adding functional updates, improving carefully designed aesthetic features, and supporting more production software like LiveStudio and vMix Go, ACME GO has become the most creative solution for live production and streaming. It is now officially up on the www.acmevideosolutions.com site and available for purchase through a network of resellers. ACME GO is a complete portable live production solution. With up to 8x HD-SDI, 4x HDMI, and even 4K inputs, content producers can mix resolutions and frame rates with embedded and separate analog audio. Content can be live streamed to popular platforms, such as Twitch, Facebook, YouTube, and other social media platforms. It is compatible with Telestream, vMix Pro, and LiveStudio - our own live video software. These flexible options provide producers with an ideal environment based on their production needs or skill set. ACME GO is a powerful workstation platform. This portable platform includes the latest Intel CPU, powerful Nvidia graphics card, DDR4 Memory and speedy NVME SSD system drive. All systems come standard with a keyboard, mouse, and wheeled transit case (with telescoping handle for convenient storage and transportation). ACME GO comes in three portable models - ACME GO 4/4, ACME GO 4/4K, and ACME GO Plus. A built-in 17.3" display allows for easy on-site setup. Take advantage of the additional LCD display capability through DVI-D, HDMI, or DisplayPort. Make use of the additional LCD display for multiviewer and other complementary applications. For in-venue IMAG output, use one of the display outputs for almost zero latency with excellent HD image quality. All ACME GO models include six removable SSD storage slots enabling ISO recording of all live camera inputs. Our SSD cartridge slots are compatible with all SSD storage. As a result, simply use any easily acquirable SSD for professional recordings of the full program output as well as individual camera feeds using ISO recording. The ACME GO Plus typically includes 2TB of SSD removable storage, formatted and ready to go out of the box. It also includes a redundant "failover" drive in the rare case of Windows failure during a live event (uses one of the removable drive bays). Professional combo jacks provide balanced XLR/TRS inputs and XLR outputs for connecting legacy analog audio mixing consoles and other equipment. This progressively eliminates the requirement for external DAC device converters. Additionally, for producers who fancy utilizing external pro digital devices, with USB ports on the front I/O panel, there are plenty of connections available for almost any audio scenario you can envision. All ACME Video Solutions systems are compatible with a vast variety of production software but are properly configured to work closely with Telestream Wirecast Studio or Pro, vMix HD or Pro, and our own LiveStudio. 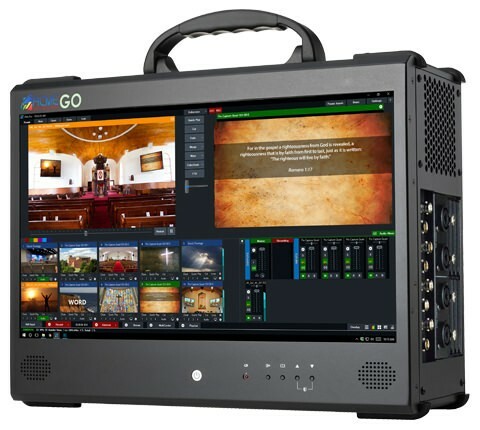 As a Windows-based media production platform, ACME GO provides a unique Return on Investment by allowing you to produce a live event and then turning the portable computer into a solid post-production and/or graphics workstation. Load up your copy of Adobe CC or Avid and create additional deliverables using media already captured and ready to edit. Use Photoshop and Illustrator to create unique titles, lower thirds scoreboards to give your productions individuality and professionalism. Even load Microsoft Office to use PowerPoint or Excel screens for presentation output. 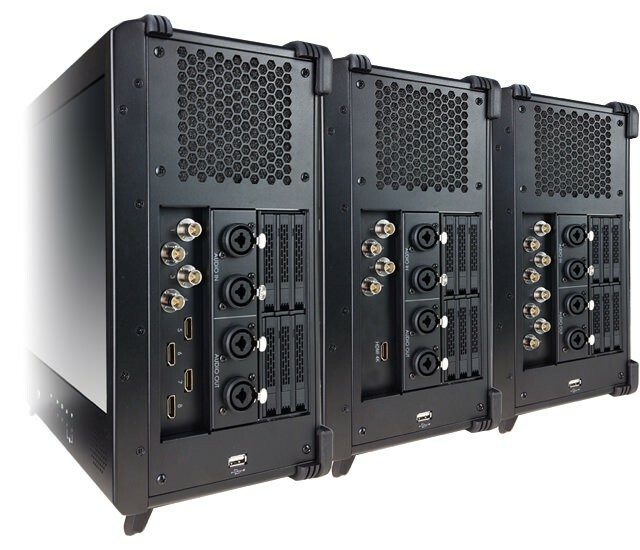 Over the past 6 years, ACME Portable has been working collaboratively with various companies to develop powerful and robust solutions for the media and broadcasting industry. ACME Video Solution's goal is to simplify and to provide quality powerful hardware solutions for content creators worldwide. For specific information, please contact one of our sales representatives.